Are you looking for challenges beyond the school curriculum? Exploring the world of problem-solving is a worthwhile pursuit, regardless of your career choice. The reasoning skills acquired through mathematics cannot be easily replicated with other fields. At AwesomeMath our passion is to bring this world to you. Our program focuses on competition math – a great way to be exposed to topics such as Number Theory or Counting and Probability and is rife with many elegant problems that are sure to excite and delight. 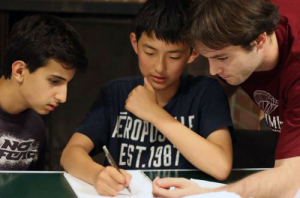 Whether you are just starting out in math competitions or trying to find resources to compete at the International Mathematical Olympiad level, we have the resources to help along the way.